Carillon Beach is an exclusive modern family resort located on the pristine white beaches and emerald waters of Florida's Gulf Coast. This is a place so enchanting it defies description. Our pristine white sandy beaches have made the ‘Emerald Coast’ of Florida famous. The village of Carillon Beach has 104 acres with over 3,900 front feet of these beautiful snow white beaches. Outdoor activities include a serene walk on the beach, swimming, surfing, kayaking, sailing, fishing, snorkeling and scuba diving. Carillon Market Street acts as the heart of the village, providing goods and services for residents and guests, thereby curbing dependence on the automobile. It is a place to gather and meet residents and visitors in an open air, relaxed atmosphere. Market Street consists of buildings that have retail establishments, eateries, and galleries on the first level and living spaces on the upper levels. 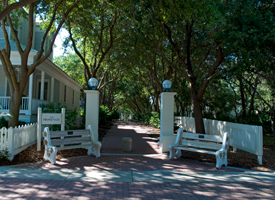 Carillon Beach Resort exemplifies the beauty and diversity of the Emerald Coast. A system of parks, and walkways interspersed through the village, offers havens for walking running, swimming, perfecting a tennis stroke, kayaking, surf or lake fishing, bicycling, and snorkeling, to name a few. The village also offers seasonal events for its guests’ pleasure.